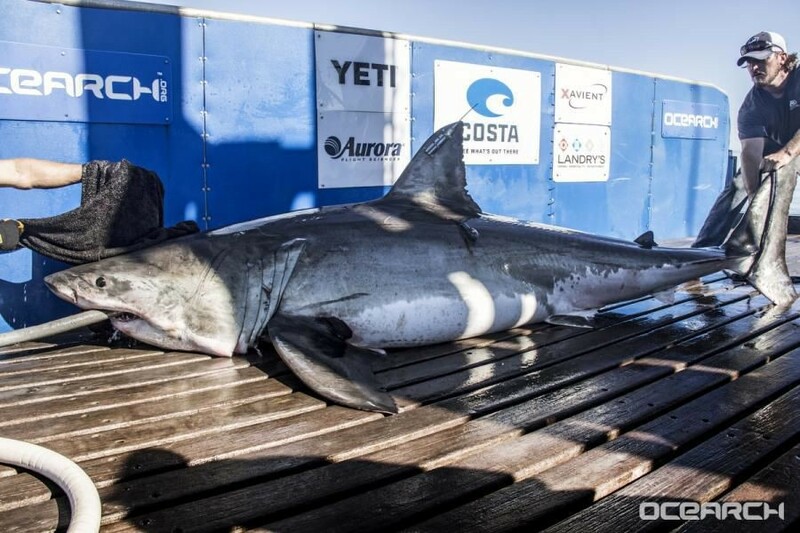 1,600-pound Great White Shark Surfaces off Virginia Beach | Street Talk | Style Weekly - Richmond, VA local news, arts, and events. Miss Costa, a great white shark fitted with a satellite tag is one of Ocearch.org's newest members. Another great white shark tagged for research purposes has surfaced off the coast of Virginia Beach. Miss Costa sent a satellite ping to Ocearch.org around 9 p.m. Wednesday. Her position was just off the Continental Shelf, about 100 miles due east of Sandbridge. She resurfaced at 9:11 Thursday morning approximately 40 miles to the north-northeast. Named for Costa Sunglasses, an Ocearch sponsor, the female white shark was tagged on Sept. 23, 2016, off Nantucket. At the time she was considered a juvenile, even at 12 feet, 5 inches long and 1,668 pounds. Miss Costa now is likely of breeding age and could be joining other white sharks in pupping waters around Nova Scotia and New England. Hilton, a similar-sized great white named for Hilton Head, S.C., where she was tagged, pinged Wednesday around Nova Scotia – an area where researchers believe many white sharks go to give birth. Miss Costa appears to be bringing up the rear, as most of the organization's tagged white sharks already have appeared in waters to the north.